February 1998. What a time to be alive! We were only two years away from the Millennium Bug destroying life as we knew it. Matchbox 20 and Aqua were all over the radio. And a four-piece band from Adelaide called the Superjesus released the little album that could, Sumo to the tune of platinum sales and a strong JJJ and commercial radio following. 20 years on and it was time to celebrate. 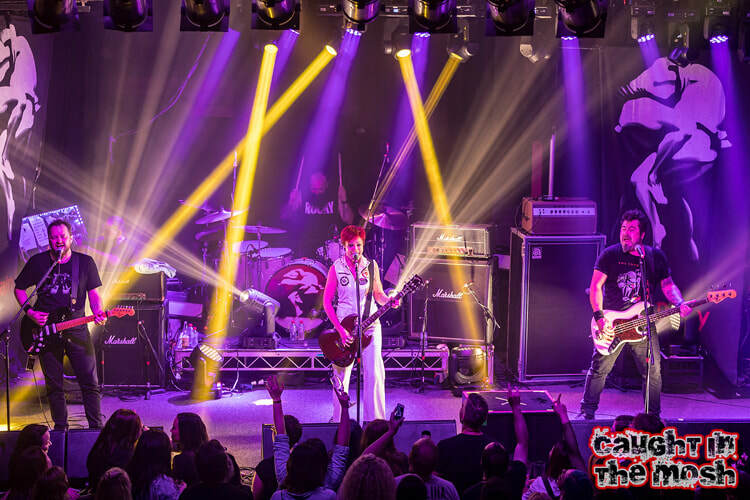 A modest crowd filled the front half of Capitol, 90% from the female community., more than likely to see the idol from their teens, The Superjesus' absolutely gorgeous and incredibly talented front lady Sarah McLeod. As the clocked ticked past 8pm the band waltzed onstage and to screams and cheers. Now, doing an anniversary tour can be incredibly up and down if bands stick to the script. Unfortunately, that's how it played out on the night. Arguably, the two best songs the Superjesus ever produced were the first two songs aired on the night as they stuck to the track order of Sumo. Blistering belter Down Again kicked things off. There were many rock stars moves and poses to fill the low lights throughout the night and nostalgia washed over all as Saturation spawned a sing along celebration. Such an amazing track should have been held for an encore but them's the breaks! Now and Then brought the mood down and gave everyone a moment to regroup. The on-stage banter was fun throughout the night, McLeod commenting on how useless the glasses of a lady in the front row were after she'd pegged her in the head twice trying to gift her a guitar pick memento from the show. Sumo tour "mementos" were plentiful, this reviewer arrive home to find a bass guitar pick in his shoe, compliments of bass man Stuart Rudd. Thanks Ruddy! ​Once Sumo was finished, the band took a 20 minute break before returning to play a second "other hits" set. Initially, only McLeod returned, sitting at the piano for the tender Setting Sun, drenched in beautiful swirling blue and orange light. The hits started flowing towards the end, strangely enough kicking off with a cover of Kylie Minogues Confide In Me, which at points was so loud it was ear splitting. In the way it should be, painfully! Secret Agent Man and most recent single, 2016's Love And Violence kept things flowing before big radio Gravity finished off the night. It was a nice nostalgic stroll down memory lane, and the Superjesus proved they still had it, tight and on point!